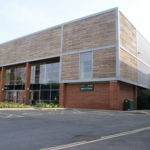 The Jubilee Sports Centre is located on Triumph Road, within the University’s Innovation Park on an operational university Campus. The Sports Centre currently offers a variety of sports facilities aimed at catering for the needs of the University community and remains open during the construction works. Robert Woodhead is currently delivering an extension to the Sports Centre. 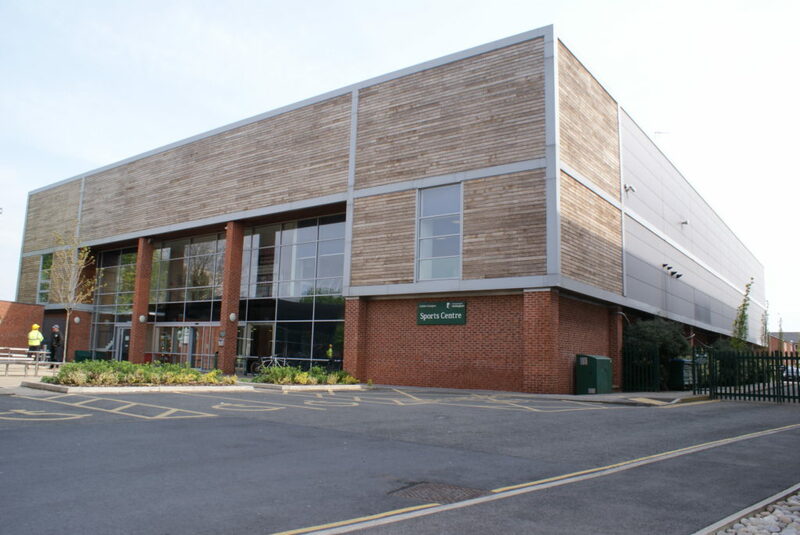 The extension is approximately 500m2 and includes the provision of a new spin studio, link corridor, glazed viewing area and high quality gymnasium space for approximately 100 stations. A 10m-4m attenuation tank, encased in membrane, with a hydro-break to control flow has been installed underground to aid the drainage. 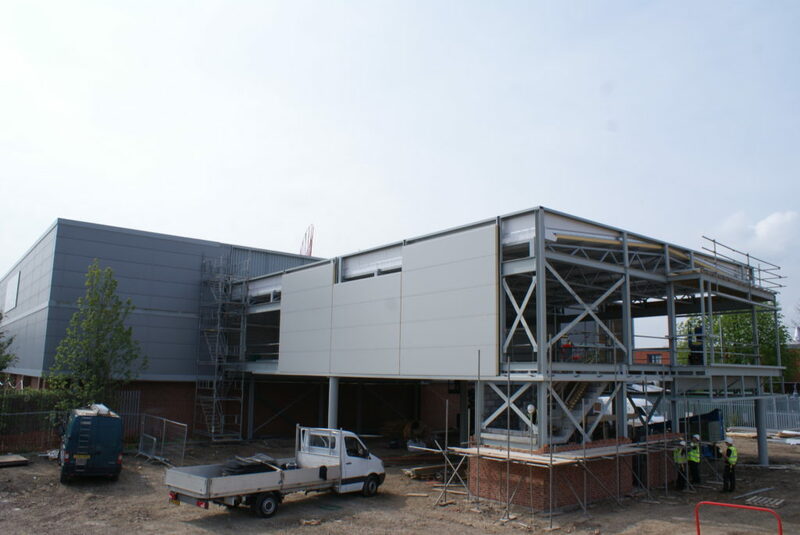 The new steel framed extension is externally clad in Kingspan Longspan cladding for increased thermal efficiency and to keep in with surrounding buildings. 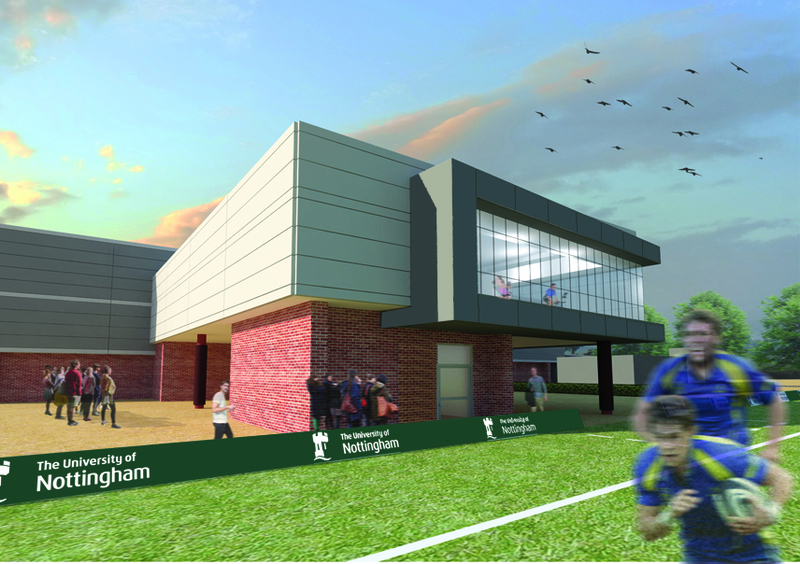 New entrances have been formed to integrate the new extension to the existing sports centre. Additional fire escapes have been created due to the increased building capacity. Undertaking an extension on a live university campus is challenging. The campus has strict traffic management and parking regulations. To overcome this, a dedicated temporary access route around the rear of the building has been created and all deliveries are programmed outside of peak university times. 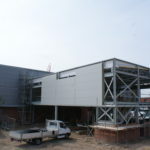 Contractor parking is controlled though permits and enforced through site inductions of all staff. Regular liaison with the Sports Centre Management Team enables the work to be programmed to minimise disruption such as any university sports tournaments which will mean significant increase in building use. The Centre Management are kept up to date with all programme and delivery information via the Site Manager. The works have the potential to be highly disruptive, in particular creating dust pollution which, in a sporting environment is a critical wellbeing risk. To minimise dust pollution, specialist segregation has been installed to protect the existing Sports Centre from our works area with a controlled access point, away from the main customer access point. The segregation prevents dust and noise escaping to other areas of the Sports Centre. The site team are also inducted to take alternative routes avoiding carpeted areas within the Sports Centre. Where this is not possible customer walkways are cleaned. Project Team: Delivery Team: Woodhead Living. Structural Engineers: Price and Myers. Quantity Surveyors: Gaskell.